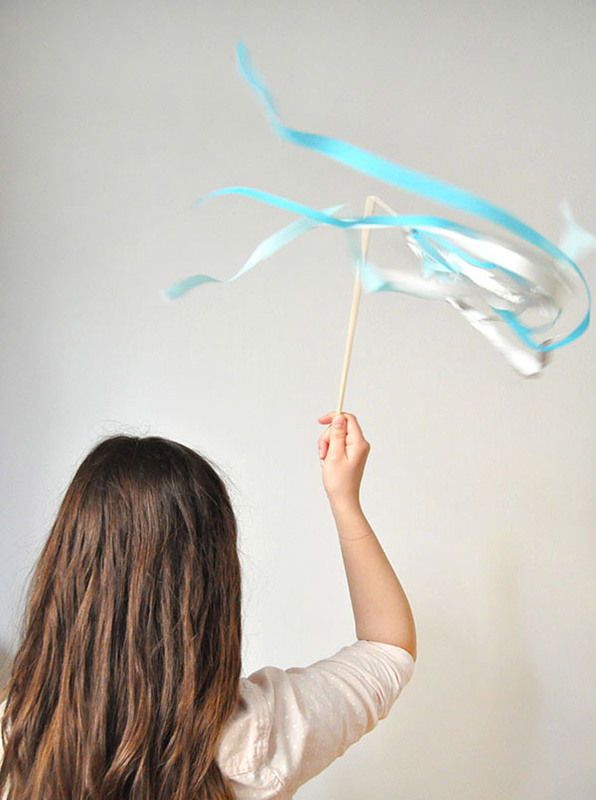 These DIY crepe paper swirlers are really simple to make, but they are so fun to play with! If you like taking pictures while waving sparklers around, these are a good indoor alternative. 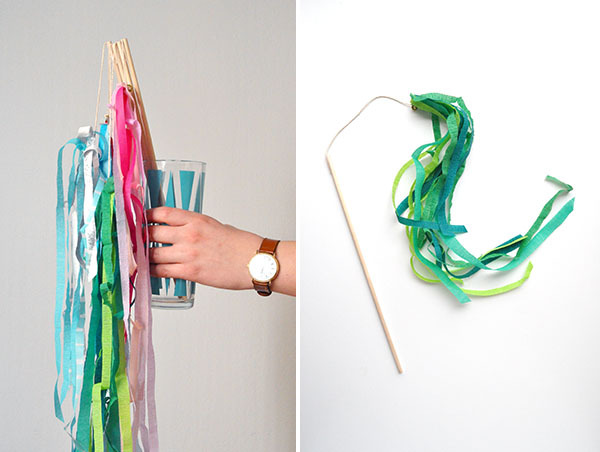 I made these with New Years Eve in mind, but I think they’d be fun for any party. 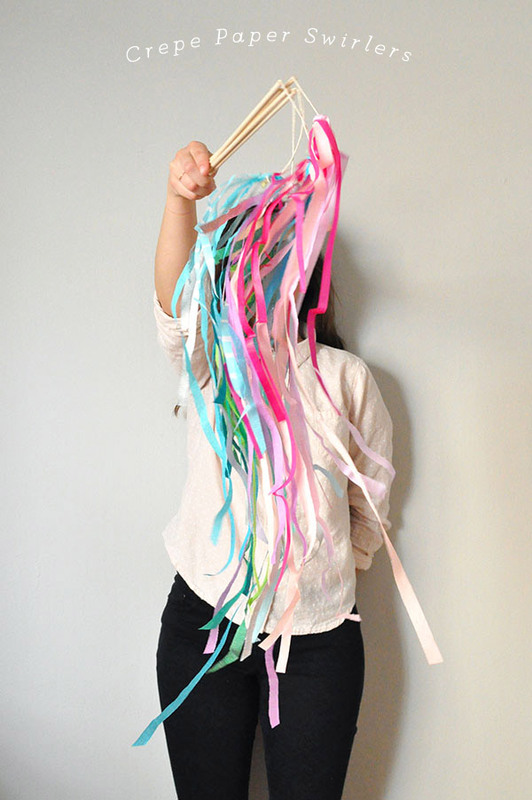 You could even make some matching confetti throwers! 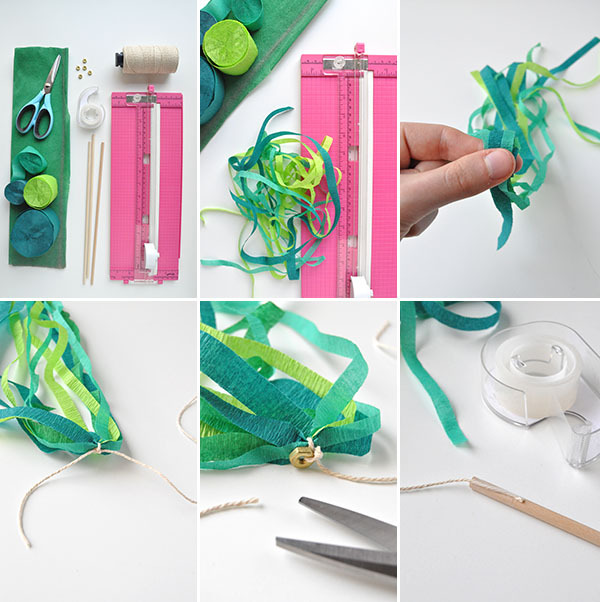 Step 1: Use a straight edge cutter to cut your crepe and tissue paper into strips, about 1/4″ wide and in various lengths. Step 2: Stack the strips one on top of the other so that the tails don’t line up – the swillers look best with some long strips, some short, and everything in between. Step 3: Gently double knot the string around the strips, leaving the tails several inches long. Step 4: Tie a small knut on top of this knot. Trim off one string tail. Step 5: Use clear tape to attach the other string tape onto the end of a wooden dowel. Why does it need a hexnut? The hexnut adds a little extra weight and I personally liked the movement better with it. If you’re making these for young children and are concerned they might accidentally hit each other with them though, feel free to leave them out. These are adorable! They would prefect for NYE or my daughter’s next birthday party! Thank you for sharing! I’m gonna make them for my friends wedding something to use during the dancing!!!! Thanx soo much for the idea. I;s just curious what is the reason for the hexnut? Would bamboo skewers work instead of the dowels? Hi Sarah, yes bamboo skewers would work too but I’d recommend cutting off the pointy end so that no one gets poked! Also the hexnut adds a tiny bit of weight to the end of the string which helps the crepe move and swirl nicely. We’ve made something similar before and they were such a hit! We didn’t use strings though. We attached the paper directly to the stick. 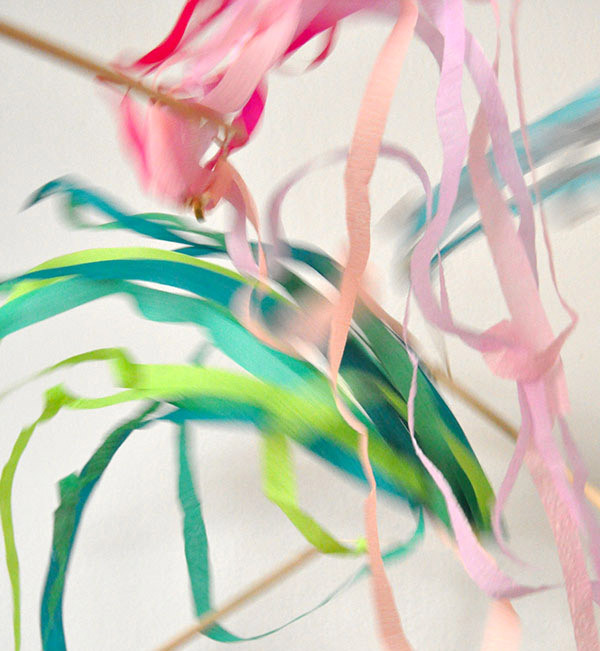 This method however looks better as the crepe paper swirls more freely. Awesome!